Charles Moore was a minister in Texas who set himself on fire to protest racism in his community. Today, we’ll hear about a new film exploring how his death affected his town. Plus, the UIC women’s gymnastics team won a conference championship but their program is still getting cut. In this March Madness season we discuss how colleges prioritize certain sports. And, southernmost Illinois is home to the state’s only national forest. This year, Shawnee National Forest turns 80 years old. On June 23, in 2014, a Methodist minister named Charles Moore set himself on fire in the Dollar General parking lot of his hometown, in Grand Saline, Texas. 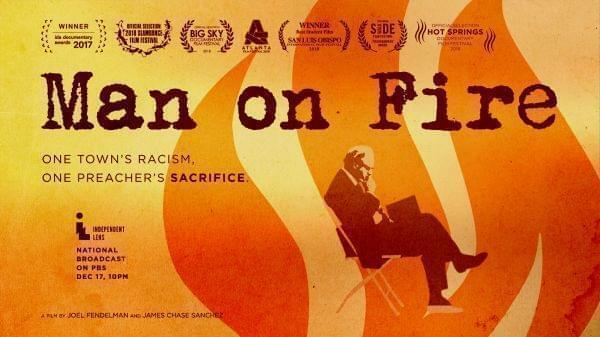 Why he did that remains a mystery and one that filmmakers Joel Fendelman and James Chase Sanchez try to answer in their documentary, Man on Fire. "James and I both walk away from this thinking, 'this was a very thought-out act.' And to call him crazy - I think we both see as a way of not dealing with why he did this." The University of Illinois at Chicago women's gymnastics team has wrapped up their last home meet ever after 40 years of competition. Back in the first week of the fall semester, UIC announced it would be ending both it’s women’s and men’s gymnastics programs to the shock and disappointment of coaches and athletes. Despite the news, the UIC women went out with a bang, tying for first place as co-conference champions and missing a bid to regionals by just one hundredth of a point. “If you would’ve talked to us in the beginning of August you could not have found people who were more excited about where the program was going to be the next three years." -@thisisuic coach Peter Jansson speaking to @McGeeReports. There is only one national forest in the state of Illinois. It covers more than a quarter of a million acres across 14 counties in the southernmost portions of our state. And about one million people visit every year. It's the Shawnee National Forest. If you haven’t been there for hiking or camping maybe you stopped by during the Great American Eclipse of 2017. That area was a great spot to see the total solar eclipse. This year, the Shawnee National Forest turns 80 years old. Molly Parker: Reporter, The Southern Illinoisan.